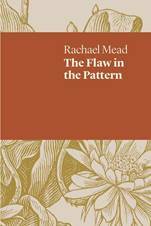 Rachael Mead’s new poetry collection The Flaw in the Pattern continues her important work of watching and speaking through the focal point of the self in the world – in particular, the natural world of place and light and senses and the tracking of our human movement through it. This is the work of a highly skilled and perceptive poet taking charge of her craft: separately these poems offer a range of engaging and challenging windows onto human experience; together they provide a fast-flowing meditation not only on a life in process but the reflective and shaping business of poetry itself. Highly ommended in the Dorothy Hewitt Award for an unpublished manuscript, this collection is now part of UWAP’s ever-expanding poetry series. The poems are focalised around different journeys, as well as physical and emotional spaces. The first series of seven poems traces the hiking days on the Overland Trek in Tasmania. ‘We tread the silvered vertebrae of the track / one foot after the other, learning the bleakness / of repetition’ (12), she writes, bringing together a fierce attention to the slippery beauty of the world around her and the ‘endurance’ (60) of our human movement, the force that impels us to engage, to keep going. The going is not always easy, and the physical journey mirrors the broader journeys of life: ‘The beauty of this land burns down my house, leaving me/with necessity on my back … the past and future just luggage waiting at the end of the track’ (14). Of course, while travelling elsewhere can certainly serve to open up such a perceptual edge and highlight self in relation to the larger, elemental aspects of time and place, these insights can also occur within the fabric of the known and the domestic. In ‘Homebody’, the poet accretes linkages between self and world, from ‘My hair, the untameable statement of eucalypt claiming sky,’ to ‘My heart, a brown kelpie, gently breathing, asleep’ (21). Or ‘Homemade thanksgiving,’ in which a trip to the kettle sees her break into the movement of dance: ‘No eyes on me but the tiny blue wrens’ / …where I’m just another creature/flinging itself through this day, / glowing like autumn on the vine’ (27). The domestic world can also be a place of anxiety and paralysis for the poet. In ‘The dog, the blackbird and the anxious mind,’ the speaker blurs with the blackbird, on the brink of being overwhelmed by the world ‘brimming with its own life’: ‘I can’t leave it alone, going over and over this world, / looking out through eyes ringed with gold’ (54). One way out of this depressive stasis, the poet discovers, is to ‘put myself in the path of wildness’ (59) – to find a structure that allows movement to somewhere uncharted. The sequence of poems, ‘Parthenogenesis,’ which describes an experience of not knowing her biological father, her mother’s experience of having a child out of wedlock and precipitously choosing a new marriage, perhaps gives some insight into a darkness which ‘lies beneath the skin’ – a heaviness to be endured and recurringly negotiated. Rose Lucas is Senior Lecturer in the Graduate Research Centre, Victoria University. Her most recent collection Unexpected Clearing was published by UWA Publishing in 2016.